Real men don’t eat quiche apparently. When I posted about this on the Kidgredients facebook page there were a lot of reactions. Why did I ask? Well Mr Kidgredients, he doesn’t like quiche. And my father never liked quiche. Which got me thinking…why not? One of my readers tipped me off to an 80’s book titled “Real men don’t eat quiche”. I’m going to look for a copy! 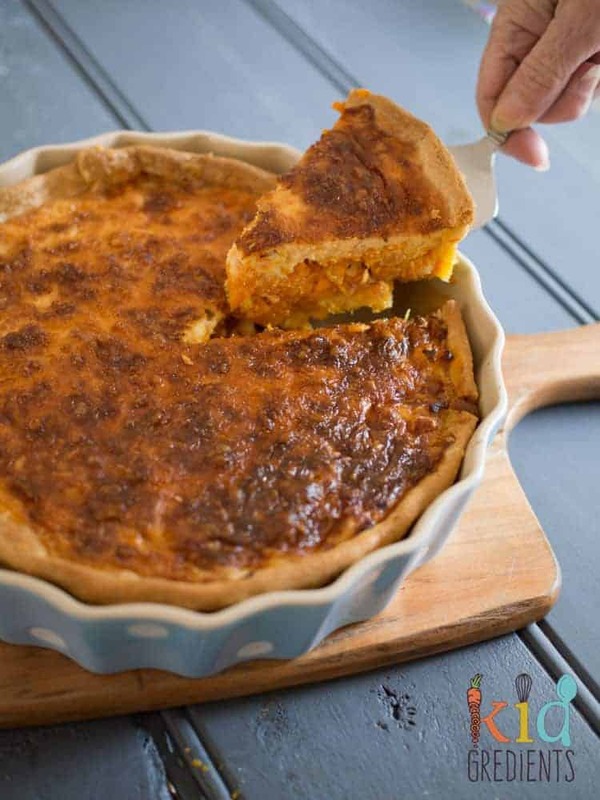 Anyway, if you have a man willing to eat quiche, then this is the best quiche to try, because this sweet potato, bacon and leek quiche was devoured by the Mini Kidgredients…and I think it tastes amazing! Now, I’d been meaning to make a quiche for a while, and to be honest I wasn’t really aware that Mr Kidgredients didn’t like it. How did I not know? 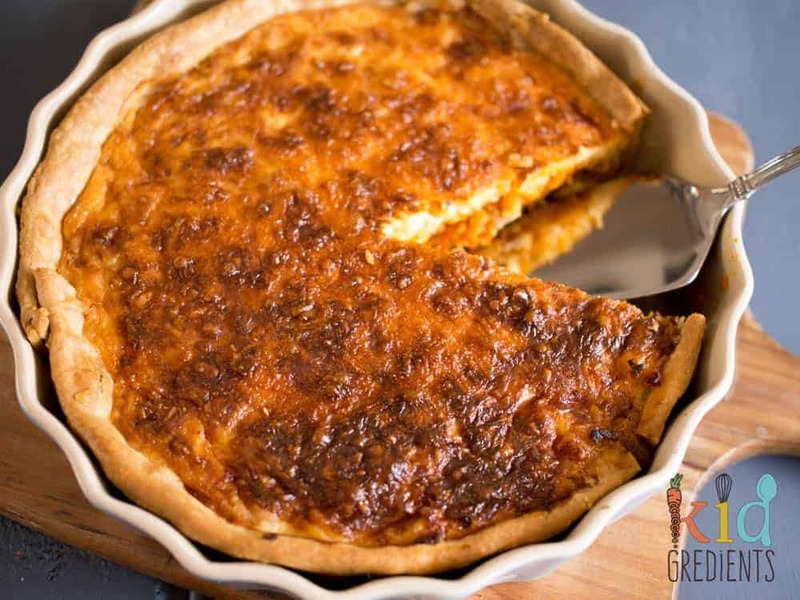 Well, I’ve known him for 16 years…and I’ve never had the idea of making quiche before! So, this quiche came about because of the school holidays and wanting to make something at lunch that could be reheated at dinner. And packed with veggies and yummy flavours…including the leek that was languishing in the fridge. And the new pie dish. I basically wanted to use my new, pale blue pie dish. Actually. I just wanted to use the pretty pie dish. But I have to say, if you have a new, gorgeous pie dish, then you should make this. Or even an old, no as pretty pie dish would do the trick. Just make the quiche already! I need to know if real men eat quiche! If the mini kidgredients eat this, then I’m sure you won’t have too much trouble getting your kids to eat it. I made this with storebought shortcrust pastry. I was feeling time poor and we had it in the freezer. Feel free to dig out your food processor and make pastry from scratch if you’re feeling that way inclined. If you want to freeze this quiche, do so in slices. 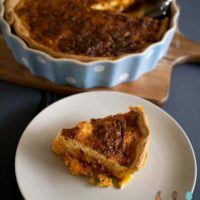 Sweet potato, bacon and leek quiche, gobbled by all at Kidgredients HQ despite the fact that real men don't eat quiche. 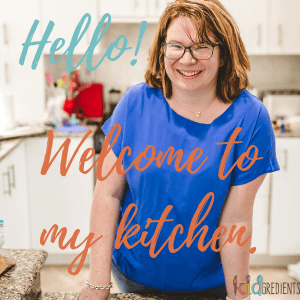 Yummy, veggie filled, kidfriendly! Don't cut the first sheet, just line the base of the pie dish. Using the second sheet, cut three strips to line the sides. Where the sides and the base join press them together. Blind bake, lined with baking paper and filled with either uncooked rice or baking weights. 15 minutes. Remove the weights/rice and bake a further 10 minutes. Meanwhile, melt the butter on the stove and cook the leeks until softened. Add the bacon and fry 3 minutes more. Add the grated sweet potato and thyme. Cook 3 minutes more. 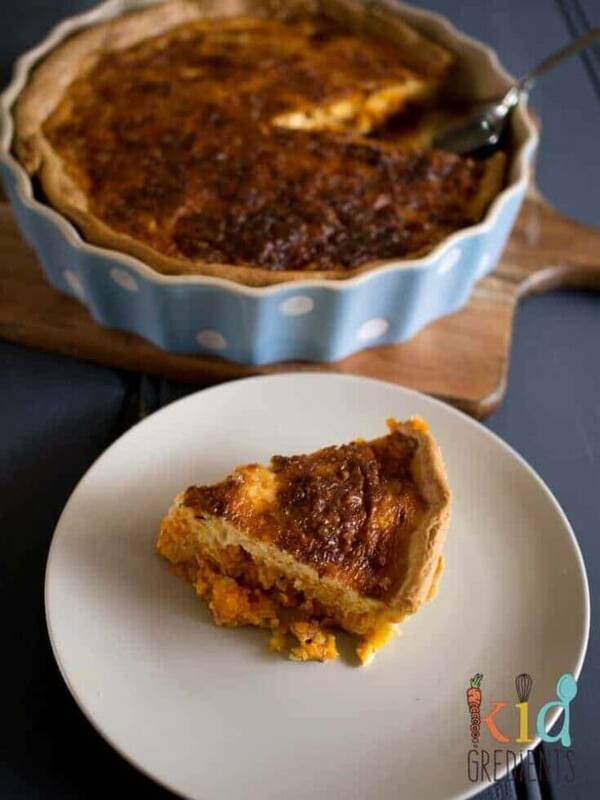 Spoon the leek, sweet potato and bacon mixture into the pie case. Mix the eggs and cream together in a jug and pour over the top. Previous Post: « Everything tastes better on a skewer! 8 skewered foods for meal time fun. Oh yum! I love sweet potato. I love bacon. I love leek! But, I have to admit that Mr Banya doesn’t ‘do’ quiches, and neither does my dad, lol. We make bacon and cheese mini quiches for the lunch box – do you reckon your recipe would adapt well to mini sized ones? I think so! Just use puff pastry or even bread as the crust! I LOVE anything sweet potato. And bacon. Oh and leeks, so I think I’m going to love this. Plus I love meals that can do double duty as a dinner and a lunch! It certainly does! I don’t actually have to read anything other than “bacon” in a recipe…and I’m sold! My husband doesn’t like quiche. Actually, I’m the only one in my house who does. That won’t stop me trying this out though. I like the new dish. oh my gosh… I mustn’t be married to a REAL MAN he loves quiche! I love love love anything with leeks in it, I love the way when they cook down they go so sweet! Lol. Just don’t let him read the book! 🙂 I love leeks because of their sweetness. They compliment sweet potato perfectly.